Steelcase and Microsoft joined forces in 2017 to create an immersive ecosystem of technology-enabled spaces, seamlessly integrating Microsoft Surface devices with Steelcase architecture and furniture to enable teams to perform at their best. In combining our efforts and expertise, we’re innovating workplace solutions that accelerate the shift to creative teamwork by supporting all of the conditions it needs to thrive. Steelcase and Microsoft have come together to explore how a thoughtfully designed ecosystem of places and devices can support the ways people work. Global partnership built on shared commitment to use tech to make workspaces better and to create well-designed places that make tech easier to use. Microsoft innovated the Hub 2 and together, we envisioned how to optimize the experience for teams. 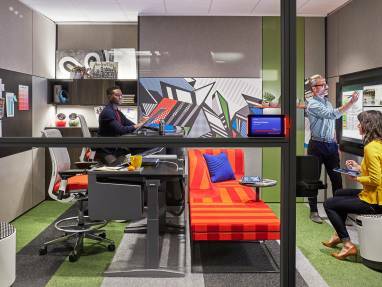 Steelcase and Microsoft can help you develop a unique ecosystem of creative spaces that is tailored to the needs of your organization. 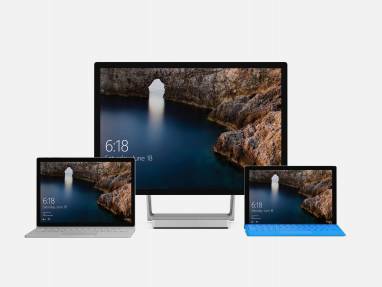 Roam and Surface Hub 2S are sold through Microsoft Authorized Device Resellers. 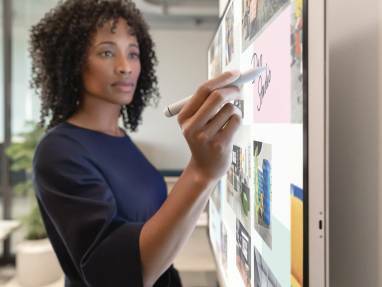 Built to empower new levels of active and flexible teamwork, Steelcase Roam is a critical support system for the newly upgraded Surface Hub 2, untethering teams from traditionally limited collaborative environments so they can work together how they like: easily, actively and spontaneously. Contact us today to learn how to empower active collaboration into your workplace with Roam.